A team of five attended the event from Paradigm initiative, including Tope Ogundipe (Director of Programs) who served as the event moderator, Tosin Abolaji (Program Manager, L.I.F.E.) who coordinated logistics, Kanyisola Olanrewaju (Finance and Asset Assistant) who assisted the event moderator, Olumide Alabi (Graphic Designer) who served as the day’s photographer and Olaniyi Ayodele (that’s me! I’m a Digital Media Assistant here and I provided live updates from the event). We had a meeting yesterday, February 28, 2017, so as to assign individual duties to all members of the team. We arrived at the Landmark event center at 9:45 am, and individual duties were reiterated. Shortly before the end of the previous events, we received our speakers: Busayo Obisakin (President, Women Inspiration Development Centre); Oreoluwa Lesi (Executive Director, Women’s Technology Empowerment Centre); and Babatunde Akinola (Corporate Affairs Manager, Intel Corporation, Intel Semi-Conductor West Africa Limited). Our event, Gender Equality in the Digital Age, started at 10.30am, with the introductory note from Mrs. Tope Ogundipe, who was the moderator of the event. Our speakers were introduced as the panelists for the discussion on how to bridge the gender gap in the digital age. All three panelists were allowed an opportunity to first express their perspective of the subject matter. Consequently, discussions were based on a question and answer session and the moderator pointed out issues and challenges that restrict women active citizenship and participation. Oreoluwa Lesi, when being asked her take on the role of the CSOs in bridging the gender divide in the digital age, started with the need for good data, citing the Paradigm Initiative survey on percentage of women compared to men who are have active media presence. She explained the need for continuity in working with this data and opined that civil society organizations will most likely see it to the end than the government, due to changing agenda of different governments. 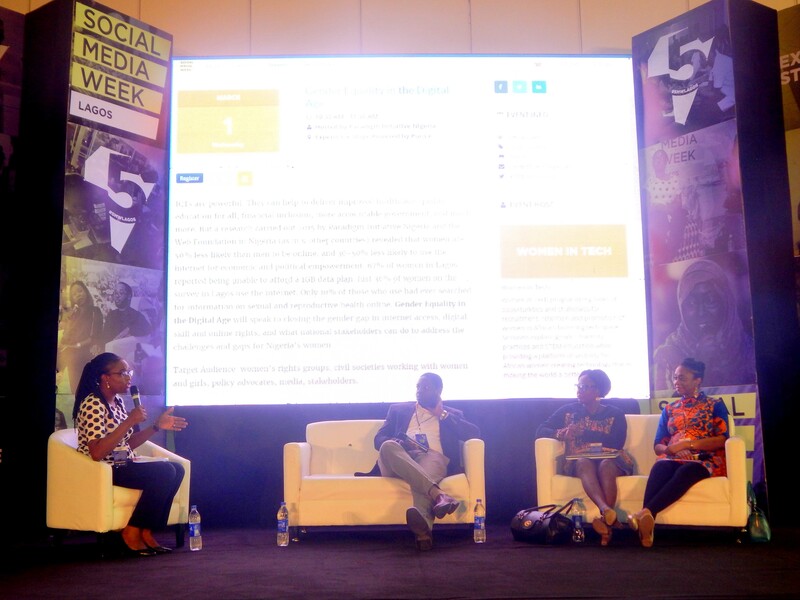 Babatunde Akinola spoke on how best to get women to participate actively on digital media and mentioned how important it is for women to make a living and expand their brand. He believes this could be leveraged by getting the women’s needs and lacing it with technology, especially when it expands their brand, through digital marketing, eCommerce platforms, social networks and connectivity, among others. He believes that women will then see the social opportunities and connectivity embedded in digital media presence. The moderator also asked how women and girls could be encouraged into active citizenship via social media. 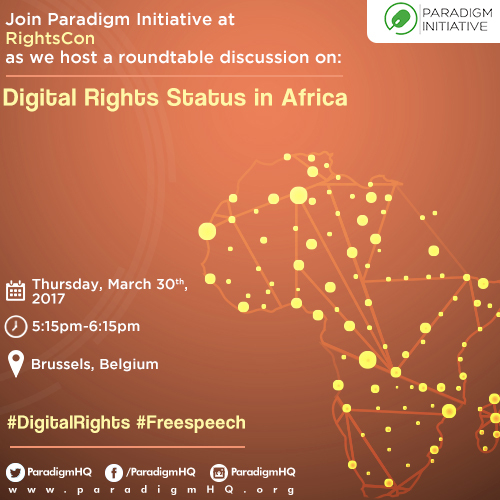 Busayo Obisakin identified poverty and lack of digital empowerment as the major challenges deterring good social media presence of women. She believes this could improve if smartphones and Internet services are made affordable. She also talked about a need for the creation of digital communities of like-minded individuals who work and communicate with each other, to uphold their mutual beliefs, debunk social consequences attached to media presence of women, and also fight against cyber bullying. Oreoluwa Lesi also spoke on the subject of active citizenship for women, via digital media platforms. She said that a culture of digital empowerment, general etiquette and general awareness of digital presence, should be popularized. It was an educative and interactive session. Questions and contributions were invited from participants, even though only two of them could talk due to time limitation. The moderator, however, urged everyone else with questions and contributions to engage the speakers or Paradigm Initiative after the event.